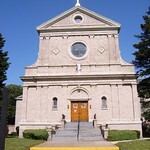 The Parish of Our Lady of Mount Carmel is one of the oldest parishes in Long Island, having been organized in 1841. The Parish grew steadily and by 1869 the original church building was inadequate. Funds were raised to purchase the current site at the corner of Newtown Avenue and Crescent Street and construction began on a new and larger church. 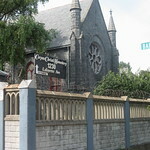 The cornerstone was laid September 9, 1871, and the completed church was dedicated by Bishop Loughlin on August 7, 1873. Plymouth Church is an historic church located at 57 Orange Street between Henry and Hicks Streets in the Brooklyn Heights neighborhood of Brooklyn, New York City. 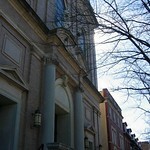 The church building was built in 1849–50 and was designed by Joseph C. Wells. The barn-like church building with its pews arranged in an arc before the pulpit became a standard design and layout for other evangelical Protestant churches throughout the United States. The Classic revival parish house and arcade which adjoin the building were built in 1913-14, and were designed by Woodruff Leeming. Corpus Christi Monastery is the oldest Dominican monastery in the United States, currently located in the Bronx at Lafayette Avenue. This is a 115-year old branch of the first monastery of nuns founded by St. Dominic de Guzman in Prouilhe, France, in 1206. The original monastery was founded by Mother Mary of Jesus (Julia Crooks of New York City) in Newark, NJ, in 1880. Nine years later, she and five other Sisters came to the Bronx, at the invitation of Archbishop Michael Augustine Corrigan. The Order of the Visitation of Holy Mary was founded in 1610 by St. Francis de Sales and St. Jane de Chantal in Annecy, France. The Monastery of Brooklyn was founded in 1855, as fruit of a Novena made by Visitation Sisters in the Baltimore Monastery. 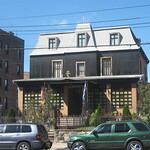 It is situated on 7.5 acres in the heart of Bay Ridge, Brooklyn. Vocation Retreats are offered at the Monastery for those wishing to discern their vocation. St. Saviour's Church is a Roman Catholic chriatian church located at the corner of 8th avenue and 6th street in Park Clope, Brooklyn. This corner lot was purchased on November 9th, 1905 by father James J. Flood, who had been selected to form a new parish on the Hill section of the Slope. The new parish was to be erected from portions taken from the parishes of Holy Name, St. Thomas Aquinas, and St. Francis Xavier. A month later, the house at 611 Eighth Avenue was purchased for $9,000 as a part of a future permanent rectory. The Van Cortlandt Jewish Center (VCJC) is a modern Orthodox synagogue affiliated with the Orthodox Union. Founded in 1927, the Center initially was housed in a street level room of an apartment building. In 1947, the Center moved into a converted mansion at 3997 Gouverneur Avenue, where it remained for 18 years. In 1965, VCJC moved into its own newly constructed building at 3880 Sedgwick Avenue, its current home. St. Nektarios Church is a greek orthodox christian church located at Bailey ave. in the Kingsbridge Heights neighbourhood of The Bronx borough of New York City. St. Nektarios, born Nektarios Kephalas (1846-1920) is a latter-day saint, recognized by Constantinople in 1961. The church building is a former private house, built in the end of 19th century as the Second Empire style house. 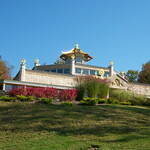 Blue Cliff Monastery is a 80-acre (0.32 km2) Buddhist monastery located in Pine Bush, New York. It was founded in May 2007 by monastic and lay practitioners from Plum Village in France. The monastery is under the direction of Thich Nhat Hanh's Order of Interbeing in the Vietnamese Zen tradition. The monastery is located in the lush green Hudson Valley of New York. Inside the property there are two ponds and a creek, and out of its 80 acres 65 are forest. Visitors are welcome to practice mindfulness with the fourfold community of monks, nuns, laymen and laywomen. Kadampa Meditation Center New York is the site of the resplendent US Kadampa World Peace Temple. It is located amid 82 acres of lush woodland in the colorful Upper Delaware River Valley. Secluded walking trails, meditation spots, a creek-fed pond, and abundant wildlife surround the Temple, inviting visitors to connect with pure, natural surroundings. Kadampa Meditation Center is an international spiritual community open year-round for tours and visits. it's rich program of Modern Buddhism includes workshops, classes, special events, prayer services, and group and individual retreats.